We’re very excited to share with you the details for our Samhuinn Fire Festival 2018 groups! You will be able to sign up to one at our Open Meeting, which takes place on Sunday 2nd September 1:30-4:30pm at Out of the Blue. When you initially sign up to one of our groups, whether by email or at the Open Meeting, we will collect your name and email address so our Group Organisers can keep in touch with updates directly related to your voluntary engagement. We will not use your information for any other purpose without first asking for your consent and we will not share your email with external organisations. More information about the Open Meeting can be found here. Have a read through the descriptions, requirements, and rehearsal times below before this weekend to see which group you think you would fit best into. We are the red heartbeat, the drummers of summer. We provide the musical setting for all creatures seelie, casting the witnesses’ minds back to the heady, intoxicating days of high summer. Then, when it is time, we pass the beat on to winter – if they’re good enough. Weds 12th Sept 7-10 pm Bongo Club. Closed Meetings. Wednesdays 7-10pm, Sundays 3-9pm. We are Dancers who will perform a sacred ceremony of dance to call upon the Callieach. Our movement is the turn of the wheel. The dance of the Goddess is housed in our bodies and released from the wild places held within us. 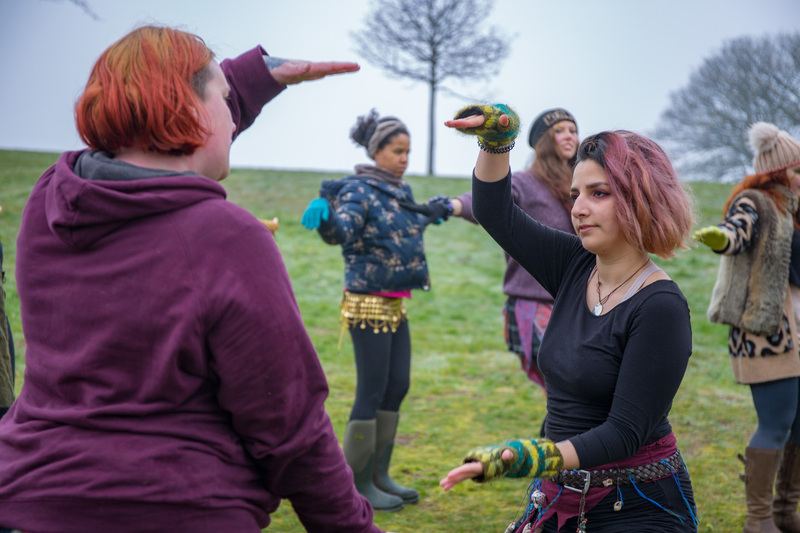 Our process is about connecting with Samhuinn through movement. Rehearsals will be workshop based and we will be exploring; The Japanese art form of Butoh, physical theatre / devising movement and dance as a form of trance. Through a process of exploration, our performance will be a culmination of the work the group has discovered and then created into a dance performance for Samhuinn. As Cailleachan, the breath of the Goddess, we work with conscious movement and voice examining themes of death, sacrifice and rebirth, allowing space for grief, release and new life. We are the turning of the wheel. We are the summoning, we are the spell. We are a high commitment group, not for the faint hearted. What we are looking for: No experience necessary just come with an open heart and a willingness to give creatively to the process. Eathlings: Enter the darkness and explore your shadow-side, then party into the light: it’s a wild ride. The Children of Seth, last seen in Ancient Egypt, where they were (mis? )taken for gods, are back, kid. With vital knowledge to impart, via psychedelic art, Acro-mmunication, and a pyramid! After selelction, there will be two practices a week, weekend practice day and time to be decided with the final group. Contact point this year are Court Jesters. Half alignied with Summer the other Winter. We will entertain and inform the audience, in the traditional comic style of the Jester, via song, storytelling, mimicry, with the odd dance and some juggling possible too. Wednesday 12th Sept 7-9 at Woodland Creatures, Leith Walk. Guth nam Marbh embody the ‘voice of the dead’, as the translation of its Gaelic name suggests. Representing the spirits of the departed, we will sing songs in Scots Gaelic which represent the process of grief and mourning. Though aligned with neither summer nor winter specifically, our group tracks the fall of the summer king, singing throughout the festival, but particularly at strategic moments during his decline. Lit as homecoming hearths and funeral pyres. In the heart of half-darkness, who sings of days gone? Announces arrivals in eloquent song? Tailored to meld information with pleasure? Loyal to those for whom battle is fought. Give up? It’s not as if this riddle’s hard. Our name’s at the top there: We’re the Herald Bards. Moncai are timeless clown spirits of death, We operate with the flow of the seasons having both summer and winter incarnations. As the summer comes to an end and the goddess changes her form so shall we. We invite all summer participants to join us in fun, revelry and party. We also invite all of our winter friends to join us as we listen to the whispers of the cailleach in the winds of truth and when the moment comes and she calls us to do what we know must be done, We will reveal our dark selves and work with the armies of winter to bring death to the court of summer. but not before we have a little fun with the nature of reality, illusion and trickery along the way. We will meet on the Meadows in the area between Boroughloch Walk and Townswomens’ Guild Walk in front of the tennis court. We are a high commitment group and would appeal to those looking to take a step up from spinning fire to performing, however, we are open to newcomers to the art. Nightwatch is a combined group of Stewards and Torchbearers that work closely together throughout the run-up to Samhuinn. 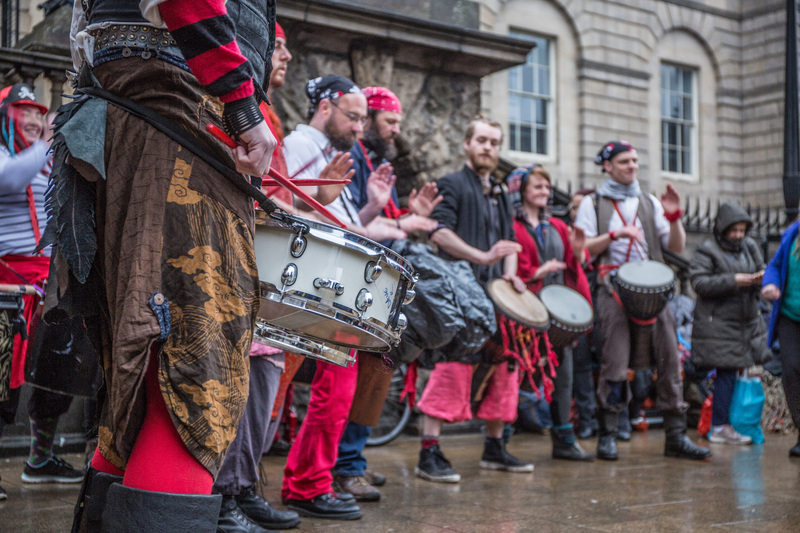 Stewards are the first point of contact for the public on the night of Samhuinn and work closely with the emergency services, Tech, the Production team, and other performance groups to ensure that everyone has a safe and enjoyable Samhuinn. Stewards are not a performance group, however we will be interacting with the audience heavily on the night, answering any questions that they may have and explaining the significance of the celebrations. Torchbearers light the way, serving as the keepers of the ritualistic fire, igniting the sacred Neid fire on the night of Samhuinn and using its light to illuminate the festivities. We act as the liminal barrier between worlds, allowing those on the outside to peer in and vice versa. Torchbearers are both a production and performance group, with minimal effort required in the performance-aspect meaning it is the perfect group for those wishing to develop their confidence and performance skills. We are looking for people of all experience levels who may not have have vast amounts of time to dedicate to the festival this year. We are also open to people with varying accessibility requirements. We will teach you everything there is to know about being a Steward or Torchbearer. Both aspects are low commitment and serve as a great way to get acquainted with the festival. This is also a great introduction to Samhuinn and the Beltane Fire Society for new, unacquainted members. Regular Torchbearer meetings will be held on Sundays, 1-3:30 on Calton Hill, as well as Thursdays 7-9 (location TBC). Regular Steward meetings are held on Sundays 2-3:30 with Torchbearers in order to bolster teamwork and build confidence in holding spaces, as well as gaining fire safety training. A while ago, before there was anything there was nothing. A while from now, after everything is done, there will be nothing. That nothing contained and was contained by and permeated everything that ever was or could be. A kind of primal void, if you will. This Void, one day she put on a mask and called herself Mother. And this Void, one day she put on a mask and called herself Child. And that, dear reader, is how we were born into this world. as it extends a hand..
Stare into the ABYSS…and the abyss may feel awkward. But yeah we can take a selfy together. Obsidian represents the unrelenting elemental power of winter. Called upon by the light of the aurora, we exist to absorb the erratic energy of summer and transform it into ice. Wild, strong and inevitable, we devour summer and exude it one last time in a fiery explosion, before banishing it inside our icy core. Our weekend away will be on the 28th-30th of September, with regular rehearsals on Thursdays (19.30-21.30) and Sundays (14.00-17.00). We will have two open rehearsals: on Thursday the 6th at 19.30 and Saturday the 8th at 14.00, gathering at the Pavillion Cafe (Meadows) and moving to Ice Point. We are Photopoint, and we are looking for keen dedicated photographers, if you would like to improve your photo/video skills and share your skills with other like minded people that want to record this special event. Then why not come along to our Open Meeting on Sunday 9th September at Deaf Action 49 Albany Street EH1 3QY between 2-4.30pm. Looking forward to seeing you. Reds are creatures of chaos and misrule, born anew each Beltane and dying at the closing of Summer as the fires are extinguished and winter takes hold. This Samhuinn for Reds is about living life to the fullest. The fire, passion and love we experienced all summer burns in us and will only be extinct when we meet our expected end to make room for Winter. The young Reds born on Beltane night are grown now into all their glory and will display as much of this as they can on Samhuinn night – along the way wreaking merry havoc and mayhem, playing with audience members, putting up human pyramids, playing with fire, pranking the other groups and making the most of the beautiful pandemonium we create. We will see other winter groups massing around us, knowing full well that they are all looking to bring on our demise – but we will not go out quietly. We will defend the fire and Summer until the end, and only when Winter brings its full fury against us will we accept our fate. Because we are strong, we are bright and we are beautiful and most of all, WE ARE RED!!! Open rehearsals: Wednesday 5th September and Saturday 8th September. We are a high commitment group. We are creatures of the dark that thrive during the Winter. We’re disjointed – some might say insane – but as Winter arrives we grow strong and we go wild. Join us in celebrating the cold season through relentless rhythms and powerful beats. We’re looking for drummers who want to challenge themselves and embrace the strength of their twisted inner darkness. Closed rehearsals will be on Wednesdays 7pm-10pm and Sundays 2pm-6pm, all at Bongo. We are burning warriors of sunlight, knights of the summer court. A band of brothers sworn to protect, we march to keep the cold at bay and keep the fire from going out for good. Our valiant knights shall charge into the darkness, a gleaming light of hope in the bleak winter night. Prepared to die in battle with glory and honour so that sun may rise once more. making sure that the props and fire effects are lit at the right time. We’ll take our fill as we did long before. Eaters of the dead and thieves of Kings. Scavengers, for ours is not the kill. Patience and trickery bring us greater things. We tell tales of greed, of life and death. A group with roots going back to 2009, the Valravn emphasise costume, voice work, ritual and theatrical performance. While this makes us a bit easier on the joints than groups doing acrobatic work, we still pride ourselves on bringing focus and professionalism to what we do. We meet on Wednesday Evenings and Sunday Mornings in Newhaven (Lothian Bus routes 7, 10, 11 or 16). If you are keen to join us but can’t make all the meetings, talk to us. While we do have a few key dates set in stone for mask making, walkthroughs and core workshops, we are aware that our members can and will have real-world responsibilities. If you’re willing to put in the work, we may be able to make arrangements. The Wild Hunt represents the sense of fear and dread which comes with the approaching Winter, and the need to confront those feelings. A pack of demonic, animalistic hunters, we will swarm through the festival and extinguish or turn the remnants of Summer. We are the feral, uncontrolled, emotional aspect of the season, the thing that overtakes you, engulfs you and changes you in a vortex of intense energy, all before you even realise where it came from. We aim to create a profound, cathartic experience in those who come in our path. But while the Hunt is terrifying to all outside it, it’s caring and warm to those inside. We are a pack, we work together, communicate without words and share every scrap of meat we peel off the summer prey. We will be very physically active, doing a lot of running, hunting, stalking, fighting. 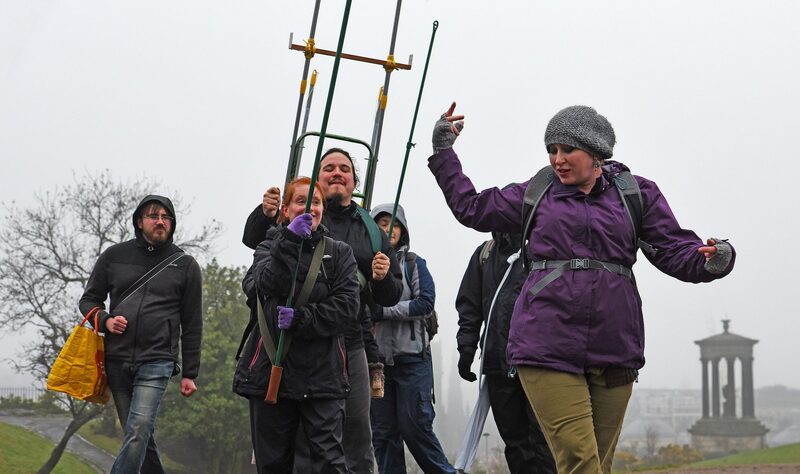 Group members will need to become reasonably fit, and have costumes which don’t prevent them from being wild and hunting. We will also do a lot of audience interaction. Open practices are Thursday 6/09, 7-10pm, and Sunday 9/09, 6-9pm. You have to make at least one of those to be considered for the group. We will meet at the carpark near the duck pond at Holyrood Park. Wear clothes you can be active in and you don’t mind getting muddy. Waterproofs will probably be a good idea. Regular practices will be on Thursdays 7-10pm and Sundays 5-9pm. Almost all practices will be outside (unless it’s seriously bucketing-it down), and some will be joint with the groups we’ll be fighting against. Our away weekend will be 28-30th September and will involve wild camping. Will there be enough strength in sight? We face the transition to Winter in fearless acceptance. A transition as romantic as it is barbaric; we embrace the darkness for even though cruel, it provides us space to listen to our heartbeats, encompass them with our fellow loved ones, our self. We are the leaders who will guide all through the darkness, and help them see the light and all that is to be gained from the change of the seasons.As a drumming group we will require our members to have a fairly good grasp of rhythm, although they don’t necessarily require previous drumming experience. For our ideas to take form, we require members who are willing to learn, who are patient and who are respectful to others around them. 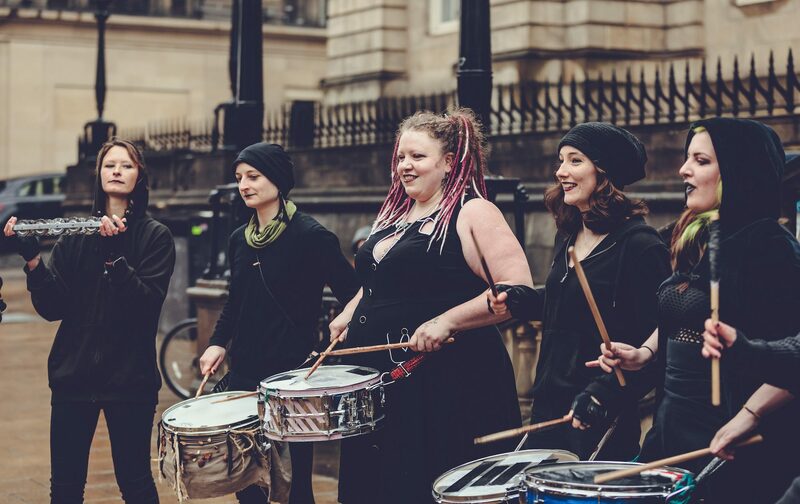 This is a high commitment group and we are looking for people who are ready to commit to learn new drum tunes, develop our character as a group and are willing to train on the combination of music with physical movement. Our open practices will be on Wednesday 5th (7-10pm), Sunday 9th (2-5pm) and Thursday 13th (7-10pm) of September. Our regular practices will be on Wednesday evenings (7-10pm) and Sunday afternoons (1-6pm). We further require that the members are free on the weekend 5-7 October. Previous Introducing our Samhuinn 2018 Court and Group Organisers!